Today during their GDC 2019 presentation, Google announced Stadia, a streaming service dedicated to bringing a gaming experience to Google browsers and devices without any additional downloads. 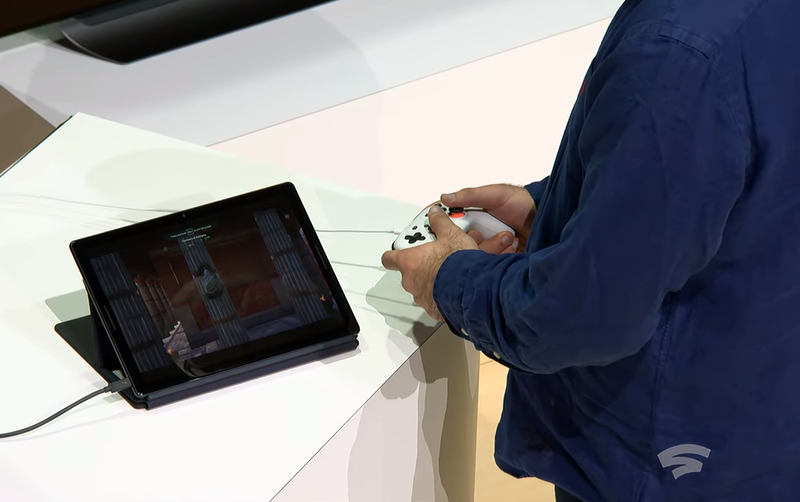 In addition, the Google Stadia controller was announced featuring Google assistant integration. During the presentation were a few demonstrations with the features of Stadia. Some of these included watching a video and hitting “play now” to immediately jump into the game, the ability to use your own controller, split-screen play without sacrificing any power from the game itself, and the ability to play on almost every Chrome device available. Doom Eternal will be one of the games that’ll support the Stadia service. More information is being revealed on the service as GDC 2019 goes on. Check back with Gaming Trend as more information comes out on Google Stadia and other exciting news out of GDC 2019. Great! Another way to play games. I was going to call it a console but it isn’t since you can play it on lot of devices. I guess it is more of a service. Something like Netflix. You subscribe and can play on any device that has their app. Of course, at home my video buffers on Friday night because of lack of bandwidth so I can’t imagine this will work well. I’m admittedly highly skeptical of this. I think that it sounds great on paper, and it’s highly ambitious, but putting it into practice is another matter entirely. One of the biggest hurdles they’ll face is bandwidth, not on their end, but on the player’s end. Simply put, the reality is that the quality and speed of access varies greatly anywhere in the world. Some areas I know don’t even have any good cable access, let alone Fiber. And if Fiber is supposed to be a solution, sadly, seeing that deployment is costly, it’s mostly seen in fragmented pockets, and mostly in large urban markets. Somewhat ironically, Google paused their development of Google Fiber, something which could have helped them in achieving this. But in the end, how realistic is it? How practical? I mean, sure, it sounds great to be able to log in from any device and just play, but it almost sounds as if public infrastructure needs to catch up before anything like this will work very well. And it sounds like broadband providers could take advantage and offer a gaming tier with much higher bandwidth, similar to what they’ve done for streaming media. Also, to add, that while developers like to sing the song of this being the future of gaming (game streaming in general), I think game streaming goes counter to current trends. Consider that there’s a growing trend in competitive shooters & battle royales and a trend towards less single-player games. Some gamers take their competitive gaming rather seriously ( ie look at Korean gaming culture), and latency is a real issue. So, I don’t really think game streaming has a place in a competitive field. I think that this kind of thing is going to work better with single-player games, and even then, games that require less precision and timing. I think it’s easy to forget that precision requires more latency as it keeps having to triangulate everything, and doubly moreso in multiplayer games. So, oddly enough, I’m not sure what kind of market this will support. But in time, I’m sure it will become evident and find its place.